In one of the most innovative and open-minded approaches to intellectual property we've seen in a long time, Toshiba is helping Japanese comic-book artists bring their work to the rest of the world through some pretty clever technology. 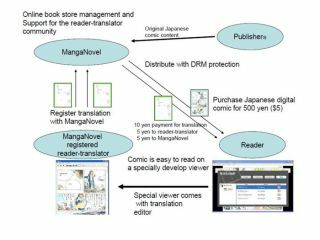 Working with Manganovel, a part-Toshiba-owned distributor of the popular manga form of Japanese graphic novels, Toshiba is providing the Web 2.0 know-how to allow expert readers to translate the original Japanese texts and submit their interpretations to a central server. Once ready, the experts can either offer their translations for 2 per cent of the original comic price or for free to encourage downloads. If other readers then buy the translations to help their understanding of the original, the translators get a 50 per cent cut of the entire translation/original package. Discussion forums on the Manganovel website will help potential shoppers choose the best translations submitted to date and offer feedback to allow translators to adjust their work and improve it. Naturally, Toshiba's expertise also extends to applying copy protection, in the form of its MQbic DRM, to the manga at all stages in the information flow. As all materials reside on a server, anything purchased by a reader can be viewed from any location. The company is also working on software to bring the Manganovel model to mobile phones and handheld games machines.